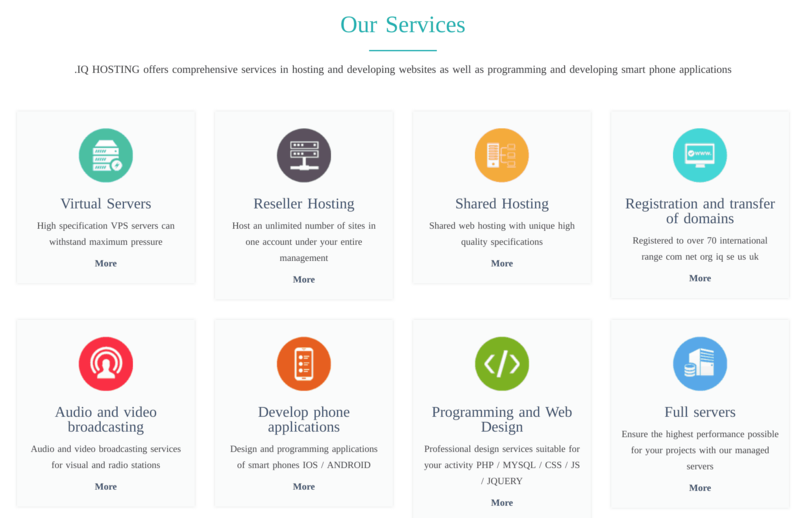 IQ Hosting Review 2019: Is IQ Hosting a Good Hosting? Iraqi hosting company IQ Hosting offers a decent set of features, but you pay the price for them. IQ Hosting has grown to host more than a thousand websites since its founding in 2008. They offer many web-related services (including registration and transfer of more than seventy international domain extensions) as well as smartphone applications. If you want to transfer an existing domain to IQ Hosting, you can do so free of charge simply by contacting customer support. Customers signing up for the first time also get to register a free domain name for the first year. You can register most international top-level domains (TLDs) at standard prices, and you can protect your privacy by hiding your Whois information. You will also receive reminders to renew your domains when they are about to expire. Of course, you can manage all the domains and files from the user-friendly cPanel that is available in multiple languages. Once your website is live, you can expect 99.9% uptime with stable and consistent server performance. The use of SSD disks ensures higher processing speeds, improved page loading times, and ultimately a better search engine ranking. There is sufficient protection available against malware, viruses, and DDoS attacks. Despite the advanced protection available against breaches and attacks, IQ Hosting also maintains a daily backup of your data just in case. You can further secure your visitors’ data by installing an SSL certificate on your website, but note that a free SSL certificate is only offered with the Business and Advanced packages. They do not mention if they also offer any paid SSL certificates, so you might have to buy them separately from a reliable provider and install them yourself. One of my major concerns is the apparent lack of an application installer. Unless it’s included in the cPanel and they simply forgot to mention it, the usual one-click installer is not highlighted on their website. And if the installer isn’t there, it means that WordPress users will have to do a lot of manual installation work that they wouldn’t have to do with other providers. IQ Hosting also offers web design and development services, to create a properly coded, search engine friendly, responsive website for you. IQ Hosting’s four packages are named Basic, Economic, Business, and Advanced. These are somewhat expensive since elsewhere you could buy unlimited hosting for the price of this provider’s Economic plan that provides only 5GB storage, 5 emails, and no SSL certificate. The higher plans get quite expensive quite quickly, and (in my opinion) are simply not worth the money. All packages except the Basic package allow unlimited domains, so that’s good, but again you pay the price for something that is really not that exciting. The live chat facility isn’t always live, so I have to assume that it’s only available during working hours. They also offer phone and email contact methods, and my guess is that it’s the email channel which fulfills their promise of 24/7 technical support. For those who want to help themselves, a help section contains articles on how to use the available features. IQ Hosting’s prices really stand out (on the high side) for a set of features that don’t really stand out. You can get the same set of features elsewhere at lower cost. Wondering how IQ Hosting stacks up against other Web Hosting companies? Enter any other Web Hosting company and we will give you a side-by-side comparison.